Localised flooding occurs when drainage systems can’t cope with the amount of rainfall or when drainage system components are undersized or become blocked. Dr Terry Lucke describes a new flow capacity and water level test protocol developed by the association of hydraulic services consultants Australia in conjunction with the Stormwater Research Group (SWRG). Building and property damage caused by inadequate stormwater drainage system design, or by the capacity of the system being exceeded, is a major problem in Australia. Flood damage due to localised flooding causes many millions of dollars’ damage annually across Australia. Much of Australia’s building and property flood damage is caused by undersized or inadequately designed grated balcony and roof drainage outlets. Many of these outlets and their associated components have had their flow rate capacity estimated using traditional methods that were based more on anecdotal “rules of thumb” rather than by scientific research based on accurate flow testing. In addition to the lack of design guidance, there has also been no official Australian Standard for performance testing of grated balcony and roof drainage outlets in the past. As such, in order to satisfy designers’ requests for accurate flow capacity data, outlet manufacturers have often had to try to undertake “in-house” outlet performance evaluations themselves, without any recognised testing protocol to follow. Understandably, this has led to a wide range of questionable performance claims from outlet manufacturers. 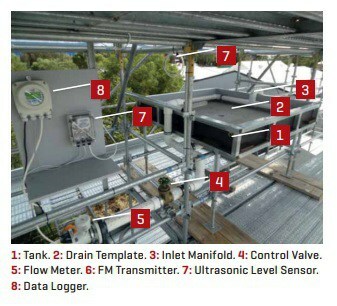 To address these issues, the Association of Hydraulic Services Consultants Australia – Research Foundation (Research Foundation) in conjunction with the Stormwater Research Group (SWRG) at the University of the Sunshine Coast (USC), have been working together with leading industry partners to develop Australia’s first ‘Flow Capacity and Water Level Test Protocol for Grated Roof and Balcony Drainage Outlets’. The new AHSCA Research Foundation test protocol has been based on testing methods outlined in leading international standards. However, the AHSCA test protocol also incorporates a number of improvements over the international standards that allow for testing over a greater range of flow conditions. A new outlet testing facility was developed as part of the project and it is part of the National Roof Drainage Research Facility which is jointly owned by the AHSCA Research Foundation and USC (Figure 1). Importantly, the AHSCA Research Foundation test protocol requires that the dramatically fluctuating water levels observed during the transition between weir and orifice flow conditions be measured thus providing realistic and reliable flow vs. head results. This critical consideration is often overlooked by manufacturers when measuring hydraulic characteristics using their own outdated or overly-simplistic testing equipment and methods. One of Australia’s leading outlet manufacturers, Specialty Plumbing Supplies (SPS) in Sydney, has recognised the need for a comprehensive outlet testing protocol that is accepted by the Australian construction industry. SPS have recently commissioned the AHSCA Research Foundation to test a large number of their outlets according to the new AHSCA test protocol. Testing of the SPS outlets will be completed by the end of the year. The results of each test will be presented on a test certificate which is issued by the AHSCA Research Foundation. The test certificate includes a design chart showing the maximum water level (mm) measured for each flow rate (L/s). The test certificate for each of the outlets tested will be available on the AHSCA Research Foundation website. The test certificates also include a link to video showing the outlet performance during testing. It is anticipated that the new AHSCA Research Foundation outlet testing protocol will help optimise outlet and roof drainage design processes in the Australian construction industry.